Your ereader isn’t the most exciting device you could use as a monitor, but it’s a minimal solution that could come in handy when you’re on the road. 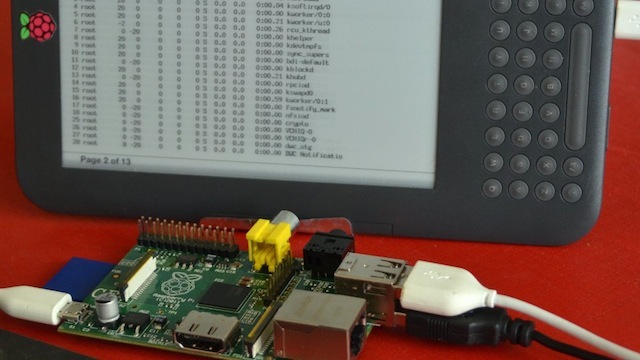 Damaru over at Ponnuki shows us how to turn a Kindle into a display using a Raspberry Pi. Using the Kindle as a screen, Damaru use a Raspberry Pi, a couple of USB cables and a keyboard to create a very minimal little computer. You do have to jailbreak the Kindle for this to work, but the rest of the process is pretty simple. From there, you only need to run a few things to get screen-sharing to work, create a system for automatic login, and you’re done. It’s about as minimal of a working environment as you can get. If you want to give it a shot yourself, head over to Ponnuki for the full guide.